Dr. Olga Trokhimenko teaches all levels of German language, literature, and culture, but particularly specializes in medieval culture and mythology, gender studies, and literary folklore. She has taught courses on German civilization, Brothers Grimms' fairy-tales, Romance of King Arthur, Origins of Modern Love, and Vergangenheitsbewältigung (coming to terms with the Nazi-past in Germany). 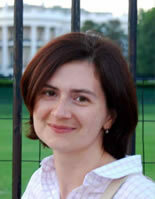 Dr. Trokhimenko's areas of research are medieval German Studies, gender and feminist studies, and literary folklore. She has published essays on gender, sexuality, and emotions in medieval German literary discourses; the function of proverbs in the works of Hartmann von Aue and J. R. R. Tolkien; and a book on the development of the proverbial expression "like a bull in a china shop" across cultures (University of Vermont, 1999). Her most recent second monograph, Constructing Virtue and Vice: Femininity and Laughter in Courtly Society (ca. 1150-1300) (Vandenhoeck & Ruprecht unipress, 2014), examines the controversial phenomenon of women's laughter and smiling in the cultural discourses of the German Middle Ages. Constructing Virtue and Vice: Femininity and Laughter in Courtly Society (ca. 1150-1300). Göttingen: Vandenhoeck & Ruprecht unipress, 2014. “Sie ist gerne iht niuwe (‘It Always Is Something New’): Love, Sorrow, and Proverbial Challenges in the Middle High German Tristan Sequels.” In: Bis dat, qui cito dat” – “Gegengabe” in Paremiology, Folklore, Language, and Literature. Honoring Wolfgang Mieder on His Seventieth Birthday. Ed. Christian Grandl, Kevin McKenna, Elisabeth Piirainen, and Andreas Nolte. New York: Peter Lang, 2015. 381-386. “‘Believing That Which Cannot Be’: (De)Constructing Medieval Clerical Masculinity in Des münches not.”The German Quarterly, 85.2 (2012): 121-136. "'And All Her Power Forsook Her': Female Bodies and Speech in the Middle High German Tristan Continuations." Journal of English and Germanic Philology, 110.2 (2011): 202-228. "Women's Laughter and Gender Politics in Medieval Conduct Discourse." In Laughter in the Middle Ages and the Early Modern Time. Ed. Albrecht Classen. Medieval and Renaissance Texts and Studies 5. Berlin: Walter De Gruyter, 2010. 244-264. "Questioning the Rod: Male Mastery and Female Resistance in Winsbeckin, mgf 474." The Proverbial "Pied Piper": A Festschrift Volume of Essays on the Occasion of Wolfgang Mieder's Sixty-Fifth Birthday. Ed. Kevin J. McKenna. New York: Lang, 2009. 215-228. "On the Dignity of Women: The 'Ethical Reading' of Winsbeckin in mgf 474, Staatsbibliothek zu Berlin-Preussischer Kulturbesitz." Journal of English and Germanic Philology, 107.4 (2008): 490-505.